Where is Facetime Contact List : Know Online Facetime Contacts | Free Pc to Phone Calls, Free Voip Calls to India International ! It does not make any sense that you are using iPhone, iPad or any other iOS device and you are not using Apple's native video calling application "Facetime". Its one of the best video calling application in the market. The picture video quality and audio quality, both are just so good. If you compare it in terms of quality, its a clear winner (even better than Skype). Many of my friends and family are using either iPhone or iPad and I can easily video call them free. But the problem is I am not aware which of my friends and family (in my contact list) are having any iOS device (capable of video calling), Even if I figure that out (by asking them), I am still not able to know whether those contacts are online or not. Skype has this contact list and it directly shows which contacts are online. These are two very basic things which are not available in facetime, and it makes me use Skype all the time (and not facetime). Today we decided that we will figure out these two simple things and make our life easy! I am assuming that you have all your contacts synced up in your iPhone or iPad (else you will have to add contacts to your device first). Here is the first view of Facetime (iOS 6.0.1). Just look at the contact list, this shows all the contacts. This is not a filtered list (of the contacts which have iOS device). Some of them don't even own a smartphone or any iOS device (why are they in this list). Task is to know which of them are using Facetime (which of these contacts I can video call). Ideally apple should scan your contact list and show only people who are using iOS (facetime). Identify Facetime (iMessage) User in Contact List. - You will need to add the contact in "To" field. - If the contact is not using iOS, then RED (!) will appear, else it will be colored blue. - While adding contact, a blue icon will also appear. - Click any contact in Facetime contact list (does not matter on which device my contact is using Facetime, it works even on Mac PC). 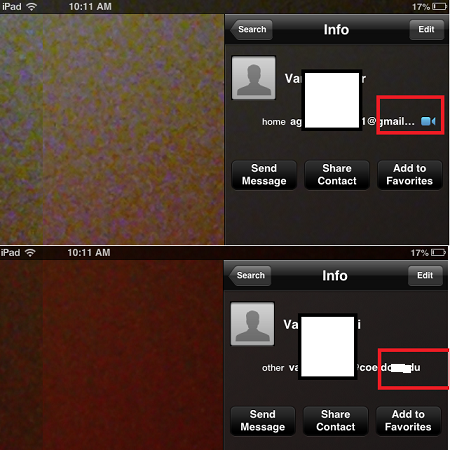 - A Blue icon will appear if he/she is using facetime. - See the different in the image below. Similar difference appear in contact list (click on any contact). We are talking about the contact app on your iPhone/iPad. This way though we are able to figure out whether a particular contact is using Facetime or not, but our objective was to get a list of contacts (filtered list) which are using Facetime. We are also yet to figure out whether a contact is online or not (it may be possible that contact is not connected to internet). - Set up the contacts which are using Facetime in Favorite section. This will be something like adding contacts in skype. This will be one time effort, but then you will afterwards know which of your contacts are using facetime.